In 2018, topics trending on the internet ranged from the Supreme Court confirmation hearings to the royal wedding. But on PowerSuite, AEE’s online tool for identifying and managing energy policy risks and opportunities, the trends looked a little different. Similar to YouTube or Twitter, “trending” in PowerSuite means an item is popular among users and particularly active, in terms of hearings, amendments, floor action, or regulatory filings. This year, legislation providing incentives for customer-sited energy storage in California and a utility’s resource plan in Michigan were the top bill and regulatory proceeding, respectively, trending on PowerSuite. But there’s more to be learned about energy policy in 2018 from choices made by PowerSuite’s 1,400 active monthly users. In California, the big news in energy legislation was passage of the “100% clean grid” bill, SB 100. But it was another California bill that was the top trending legislation in PowerSuite nationally all summer long. Passed by the legislature and signed by Gov. Brown, SB 700 reauthorized California’s signature Self Generation Incentive Program (SGIP) for another five years to bring to market new distributed energy technologies, including customer-sited energy storage – and the “trending” status of SB 700 was a function of the burgeoning business interest in energy storage in the Golden State. Although California’s SGIP bill was closely tracked – and much amended – as it worked its way through the legislature, its prospects for success were always good. PowerSuite’s machine learning-based bill forecast – a feature available to PowerSuite Pro subscribers – indicated a 76% (or “likely to be enacted”) chance of passage at the time the bill was introduced. Among Public Utility Commission (PUC) dockets, it was Michigan electric utility Consumers Energy’s integrated resource plan that set the trending pace. Addressing a wide variety of energy resources – including solar, energy storage, energy efficiency, demand response, and conservation voltage reduction, as well as the retirement of four coal-fired power plants – this IRP attracted wide-ranging interest among PowerSuite users in a docket opened in 2015 but with dozens of filings in 2018 alone. 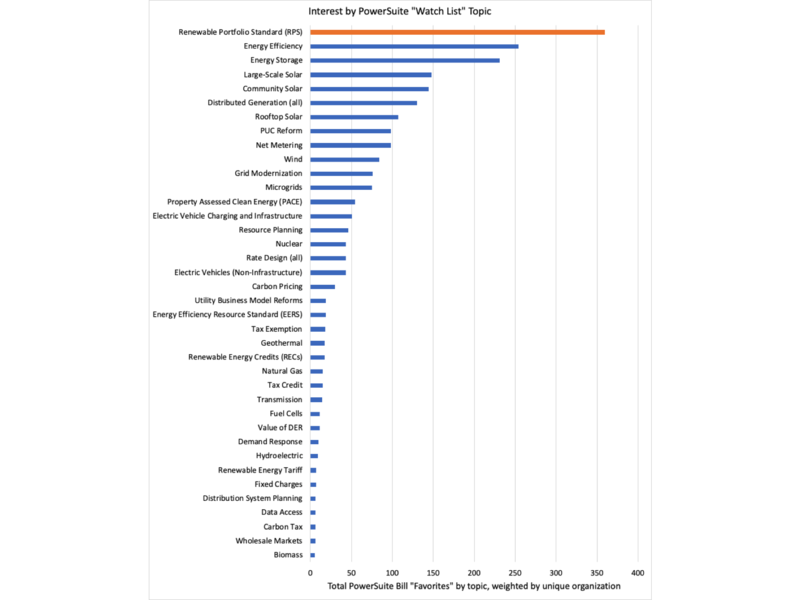 PowerSuite users indirectly show their interest in specific legislative and regulatory topics as well, based on what they are tracking as “favorites.” The PowerSuite team curates common energy policy topics into “watch lists” for easy reference. 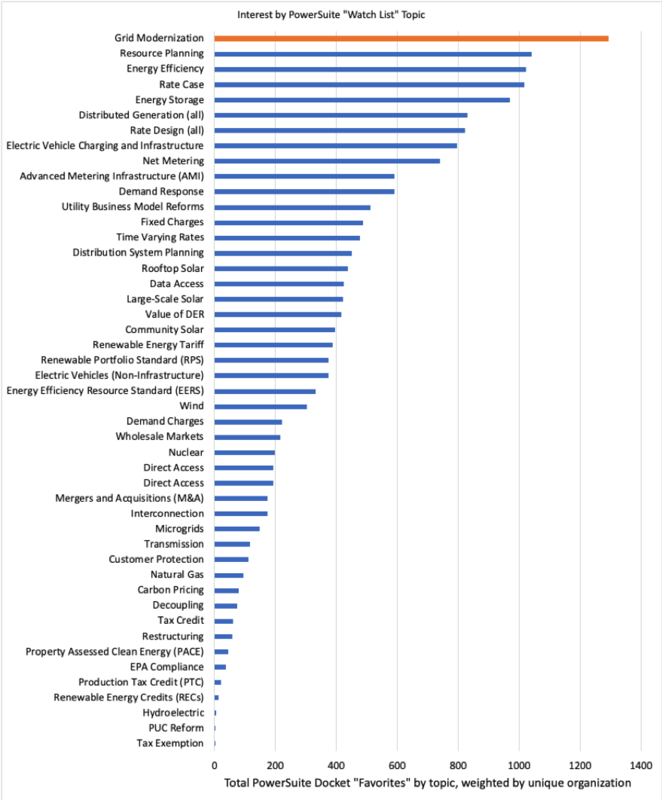 Among those watch lists, regulatory dockets categorized under “Grid Modernization” were favorited the most in 2018, with 1,872 tags, followed by a cluster of others: resource planning, energy efficiency, and rate cases. Fig. 1: 2018 AEE PowerSuite Utility Docket Favorite “Watch List” Topics. Full list here. Fig. 2: 2018 AEE PowerSuite State Legislative Bill Favorite “Watch List” Topics. Full list here. Custom Reports: Need a report on bills or dockets to share with your colleagues? With one click, PowerSuite can generate a Word document or spreadsheet on the legislation or regulatory proceedings you are following. “Favorite” and “Trending” Filings: PowerSuite users can now "favorite" specific regulatory filings just as they can with dockets. In addition, users can see what filings within that docket are “trending” – attracting the most interest and activity among PowerSuite users. Example: This Arizona docket has generated more than 250 filings, but with one click you can zero in on the six specific filings that are trending on PowerSuite. A powerful tool for separating the signal from the noise in the complex world of energy policy, PowerSuite is now used by more than 250 companies, utilities, government agencies, nonprofit organizations, educational institutions, and media outlets. If you’re not using PowerSuite yet, sign up for a free trial by clicking below.